How can an Intelligent PDU (iPDU) help your data centre? 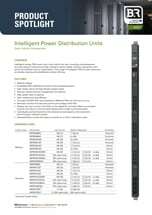 Intelligent PDUs, or iPDUs, are a small but essential part of the data centre energy supply chain. An Intelligent PDU works like a brain within the rack, providing comprehensive, accurate energy measurement data needed to reduce waste, enhance operations, and prove the business case for optimisation. The Intelligent Power Distribution Unit sits within the rack continually looking for threats from electrical circuit overloads, and any physical or environmental conditions which might place critical IT computing loads at risk. Outlining common challenges facing data centres, and the benefits of Intelligent Power Distribution Units. B&R’s iPDU brochure, outlining our latest range of intelligent PDUs, further enhancing an already existing and established product offering. A brief overview of the features of B&R’s range of iPDUs.